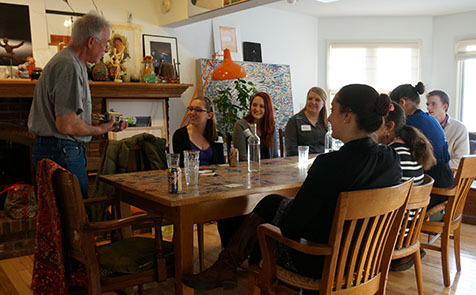 For several years, the Honors College has organized a series of faculty-hosted dinners called "Fireside Chats" for new Honors freshmen. In addition to providing a venue for informal interaction between faculty and new Honors students, the Fireside Chats serve to welcome Honors students to MSU and promote their participation in our learning community. Discussion topics for Fireside Chats are at the discretion of the hosts. Many events are hosted in the homes of faculty members or at campus facilities. In some instances, hosts invite colleagues or upper-level students to share their experiences as well. Incoming Honors College freshmen may sign up for Fireside Chats during Fall Welcome in August. The events traditionally occur on Sunday afternoons and evenings. For more information on Fireside Chats, please contact Dr. Bess German at germanr@msu.edu. Review the available Fireside Chats for the Fall 2018 semester. Be sure that you are available to attend on the posted date and time before registering for a specific chat. Each student may attend one chat. We ask for your top 3 preferences in case all of the available spaces for your first choice have been filled. Exact locations will be communicated to participants via email. If the location is off-campus, an on-campus meeting place will be designated and participants will travel together to the chat site. That is, transportation will be either in a college vehicle, the host's vehicle, by bus, or by foot, depending on proximity. To request any additional accommodation to reach these venues, please contact Jackie Heymann at heymannj@msu.edu. Please sign-up via this Google Form. I had a terrific time at my fireside chat! The meal was fantastic and the conversation was very relaxed. All in all, I would say that the fireside chat program is a great way to spend an evening! The fireside chat was very interesting and fun; there was a lot of great food there and the atmosphere was awesome. Talking to faculty outside of a school setting was very nice. The fireside chat has been my favorite event of the year so far; a great night filled with fantastic food, wonderful hosts, and a relaxing way to share my interests with new friends. Dinner was delicious, the faculty offered valuable information in regards to academics and campus life, and I met incredible Honors College colleagues that I will surely be lifelong friends with. I had a great time at my fireside chat with other Honors College freshman that share my interest in theatre, and two fantastic professors that were really interested in what we had to say and how our first year of college was going. I'm so glad I signed up!